This simple meal provides a perfect balance of healthy fat, protein, and fiber for a fast dinner. Wild salmon is a great source of anti-inflammatory omega-3 fatty acids, which decrease pain and support cardiovascular health. Optional do-ahead: If you're making pickled coriander, combine red wine vinegar, bay leaf, black peppercorns, whole cloves, turmeric, salt, honey/coconut sugar and coriander seeds in a small saucepan and bring to a boil. Remove from heat, let cool slightly and pour into a heat-proof, airtight glass jar. Allow mixture to sit at room temperature for at least 24 hours, up to one week before using. De-vein swiss chard leaves and save stems. Roughly chop stems and break leaves into large pieces. Heat 1Tbs. olive oil in large sauté pan over medium heat and add stems and fennel seeds. Sauté, stirring frequently, until beginning to soften. Add leaves and cook until they are just beginning to wilt. Remove from heat, transfer to a bowl and set aside. Preheat oven to 350 degrees. Rub salmon fillets with ground coriander, sea salt and fresh cracked pepper. In the same sauté pan, heat 1 Tbs. olive oil and increase heat to medium-high. Add salmon fillets, skin side down and cook 5 minutes. Do not flip, transfer to oven and cook an additional 3-5 minutes until beginning to flake. 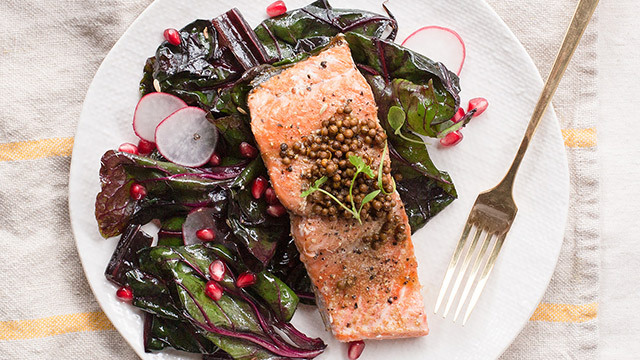 Serve each salmon fillet with wilted chard and topped with pomegranate seeds. If you made the pickled coriander, top dish with 1 Tbs. pickled coriander.